Shudhodhan lives in a town in Maharashtra with his entire family. Recently, he was in need of a personal loan. He decided against going to a bank as he was apprehensive about the process and time that would take. While checking out various options for personal loans online, he came across Money View Personal Loans advertisement. The rest is a very happy story. How did Shudhodhan come across Money View Loans? Shudodhan clicked on the ad for Money View Personal Loans and downloaded the app. He was quite happy that there were players like Money View that offered personal loans with minimal process. He followed the process as mentioned on the App. To his pleasant surprise, his loan was approved on the same day when he submitted the documents and was in his bank account by evening. Shudhodan mentioned to me that the process was unbelievably simple and stress free. He took a couple of days to gather the documents that he needed to upload. On uploading the documents, his loan was approved within hours and money was in his bank account by the same evening! Imagine that! 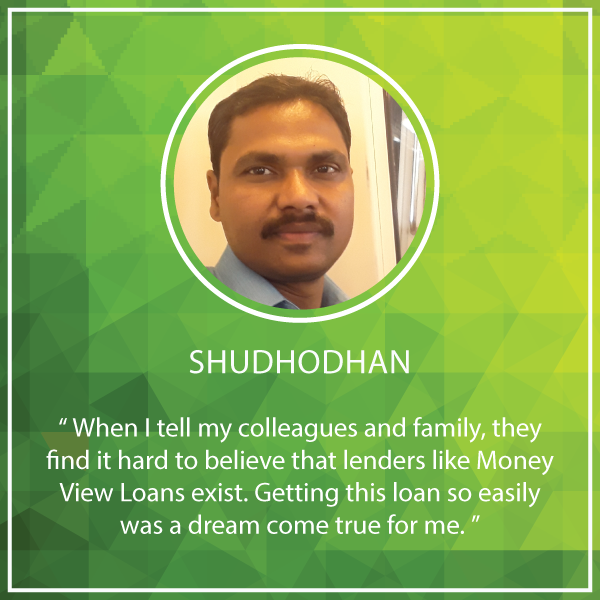 According to Shudhodhan, Money View Loans is a very easy app to use. Simple, straight forward instructions are helpful. Easy Loan: When he needed a loan, he was worried to approach a bank due to long-winded process and multiple visits needed. Money View Loans was a total contrast with easy online approval and disbursal. Fast Disbursal of Loan Amount: After approval, Shudhodhan got the money in his bank account on the very same day. It took just about 8 hours. He was absolutely delighted and stunned with the efficiency of Money View Loans. No Face-to-face Meeting: Shudhodhan could not believe that Money View Loans gave loans without requiring a single personal meeting. This is very useful for people who live in far away places and those who want the convenience to do things online. Get Personal Loans Easily: No matter what your requirement, Money View Loans gave loans from Rs. 10,000 to 5 lakh for any of your needs. You now don’t need to keep your dreams on hold for lack of money. Customer Centric: Money View Loans cares about the customer. Hence the entire process is kept simple keeping the customer in mind. We are delighted to be making a difference in the lives of people like Shudhodhan and helping them achieve their aspirations. It’s amazing beyond my expectation . Though rate of interest is little bit higher but during emergency it’s unbelievable I am quite doubtful how it is possible. But it’s true. Money view has its great future in modern days. Thanks so much, Pinky. We are very happy that you were so pleased with Money View Loans. I am afraid not at the moment.